Welcome to Dream Palace Online PaySafeCard Casino! We make pay and play easy by offering the PaySafeCard method. Your first deposit of 10 up to 200 USD/EUR/GBP is welcomed with aWelcome Bonus 100% up to $/£/€100 + 20 Free Spins on Shaman's Dream. Want to know how? Just follow the steps of our guide below! Create an account and make for first deposit at Dream Palace Casino! Ready to play over 400 games? You are just 2 minutes away from a great gaming experience, let’s go! Step three: Play and enjoy! It could be the steps above are a bit to summarized for you, so let’s look at them more closely! Step one is easy to complete, just navigate to DreamPalaceCasino.com and press ‘ join now’ or simply follow this link. If you fill in the registration form properly and verify yourself by the message send to your phone, you are welcomed to DreamPalace PaySafeCard Casino! Now it’s time to make your first deposit using PaySafeCard as your primary payment method. Simply choose PaySafeCard and fill in the amount you wish to deposit. 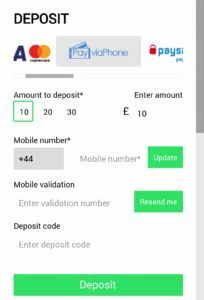 Remember you need to make a first deposit of a minimum 10 USD/GBP/EUR! There is no need to fill in a special code: ALL first time depositors are awarded this bonus! You will find the bonus on your play fund balance, once the deposit is complete. Buy offline at a shop you trust and keep track of your expenses. No unpleasant suprises! Paysafecard is combines the best of online with the ease of your favorite shop around the corner. There are over 10,000 locations to buy your card, so there is always a selling point nearby. There is no need to share any information with third parties using this payment method.